The graphic novel has gone nova, giving the moribund publishing industry a much-needed bump. However, the graphic novel is only a form and not an end in itself. It cannot make a dull story interesting, even if the endless parade of talking heads tricks you into reading something you might otherwise not. This lengthy, detailed history of SDS will be mostly of interest to aging radicals, presenting, as it does, an uncritical look at a weird chapter in American politics. Paul Buhle, who pulled this volume together and has written several chapters, is the long-time editor of Radical America, whose title tells you all you need to know. The first entry is the longest - Harvey Pekar's fifty-three page history of SDS. Fifty three pages of names and faces streaking by leaving no indelible impression. Endless recounting of endless meetings which must have been as deadly tedious to the participants as to the reader. On page 25, a nameless socialist drone states, "When the new workers realize the power they have, they will conclude that they can use it 'as a force of social change.' Students can start to make an impact on society." Hot damn! The book is packed tight with socialist jargon, crying out, unheard, to be satirized. Gary Dumm's art has its charms, but his characters seem a little too big-eyed and sunny, whereas the police are depicted as sinister goons. Backgrounds are virtually non-existent which I found particularly disappointing during the long Madison Strike Riot segment that deals with the Dow Chemicals protests in 1966. I was on campus at the time and remember the whiff of tear gas. The Madison Police Department was considerably less enlightened in those days, and the cops used the opportunity to break the skulls of people they presumed to be anti-authoritarian. And they were correct. Back in the day, it was fun to riot, to run from rampart to rampart throwing bottles at the cops and pretending to be a real revolutionary. Paul Buhle is a gentleman. He's also responsible for Radical Amerika Comics, a groundbreaking underground that was truly funny. Gilbert Shelton's Wonder Wart Hog episode satirizes straight America in a way that this sanitized history cannot. Mike Baron worked for the Boston Phoenix, Boston After Dark, and the Real Paper. 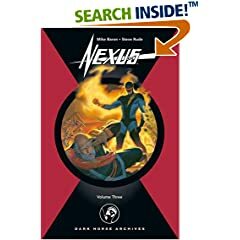 He broke into comics with Nexus, his groundbreaking science fiction title co-created with illustrator Steve Rude. Baron has written Marvel's Punisher, DC's Batman, Deadman, and Flash. Nexus has garnered honors too numerous to mention, including Eisners for both creators. Baron has written Star Wars for Dark Horse, Turok, Dinosaur Hunter and Archer & Armstrong for Valiant, and has three issues of Legends of the Dark Knight in the works. A prolific creator, Baron is at least partly responsible for The Badger, Ginger Fox, Spyke, Feud, and many other comic book titles. He currently has two new web comics up at Big Head Press. The Architect is a horror story based on the life of Frank Lloyd Wright. The Hook is rock and roll science fiction - think Farenheit 451 only instead of banning books they have banned music. Volume 3 out now! Visit our Comic Book News Archive.